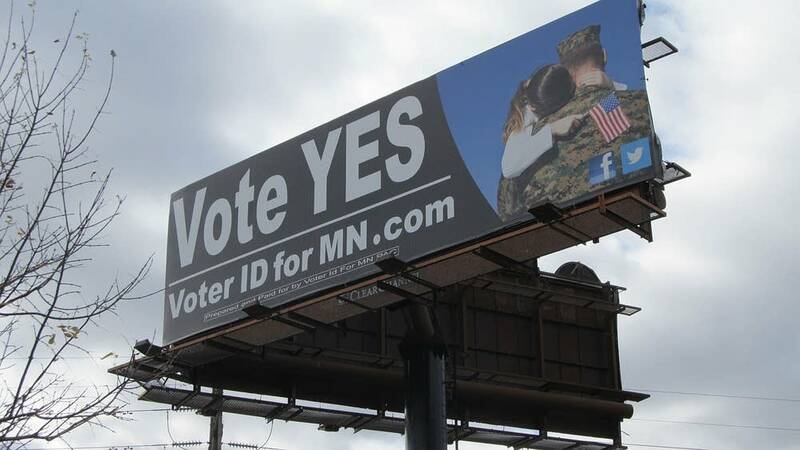 Military veterans have moved front and center in the debate over Minnesota's proposed voter ID constitutional amendment. For voter ID supporters, veterans are a symbol to sell their message of election integrity. Opponents have turned to veterans to point out the potential problems that soldiers could face when they try to vote. The pro-amendment campaign organization Protect My Vote started airing its first television ad last month. The 30-second spot features Robert McWhite of Minneapolis, a 91-year-old World War II veteran and former prisoner of war in Europe, who talks about defending the nation and its ideals. "Nothing is more central to America's success than the right to vote," McWhite says in the ad. "That's why I'm supporting the effort to protect that right by showing photo ID." Dan McGrath, chairman of Protect My Vote, said the ad is certain to appeal to voters who respect the military. "We did focus group testing on a number of different concepts, and one of them was around the idea of defending democracy," he said. "We tied the idea of defending democracy in war, military veterans, with voter ID, and it focus-group-tested very well. So that's how our ad came together." Additionally, McGrath said, the ad tries to address accusations from amendment opponents that a photo ID requirement could make it harder for soldiers, veterans and the elderly to vote. He insists that everyone who is eligible to vote will be able to obtain an ID and cast a ballot. As for current military personnel, McGrath insisted nothing will get in their way. "Soldiers overseas are protected by federal laws, and their vote can't be threatened by a constitutional amendment or a state statute." McGrath said. Voter ID opponents said the amendment would threaten the ability of soldiers to vote. Greta Bergstrom, a spokeswoman for the anti-amendment campaign organization Our Vote Our Future, said the pro-amendment ad uses "powerful imagery" to mislead voters. Bergstrom said she thinks the ad tries to make voter ID sound simpler than it really is and neglects to tell voters that it could set up procedures that inhibit people in the military from voting. "We know that there are over 11,500 military and other overseas voters that are in this position overseas that absolutely rely on and depend on mail-in balloting," she said. "If this amendment actually were to pass, their ability to self-certify their absentee ballot will actually go away." In making her case, Bergstrom pointed to a specific sentence in the proposed constitutional amendment that reads: "All voters, including those not voting in person, must be subject to substantially equivalent identity and eligibility verification prior to a ballot being cast or counted." She interpreted that to mean military and other overseas voters will be required like everyone else to show photo identification that includes their current address. A former Marine shared Bergstrom's concern. Ashwin Madia, a Minneapolis lawyer and one-time DFL congressional candidate in Minnesota's 3rd District, said that he voted by absentee ballot in 2004 while serving in Okinawa, Japan, and that he did not have to prove his identity to anyone. Madia said he's concerned that what was an easy process will be much harder with a voter ID requirement. "Now, these aren't insurmountable obstacles by any stretch," he said. "If someone was very dedicated, these boxes could be checked. But they do impose additional hurdles and additional burdens and additional time on people that I think are already very busy doing a lot of important work for the country. I don't really see the need for that, and I don't think it's particularly appropriate." The disagreement over the potential impact of voter ID is fueled by the lack of detail in the proposed constitutional amendment. The brief document makes no mention of military or overseas voters. If voters pass the amendment in November, state lawmakers will have to fill in many of the blanks next year with enabling legislation. Other states with voter ID laws have exemptions for soldiers or allow the use of U.S. military identification.